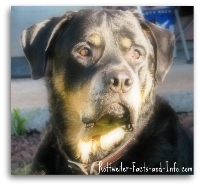 How to train a Rottweiler Series - Training a puppy to sit and lay down! 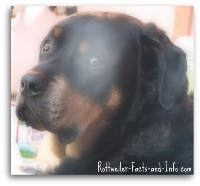 This portion of how to train a Rottweiler series focuses on how to train a puppy to sit, and that will lead into teaching your puppy to lay down. The time you spend training your puppy will be a little easier if you teach the sit and down commands prior to teaching the come / recall command. First of all, be proactive - Every time she sits on her own, say the word "Sit" and praise her with an enthusiastic voice. Hold a treat in your hand and make sure she can see it at nose level. Move the treat up slightly and over the top of her head. Her natural reaction will be to follow it backward, which will cause her to sit. As soon as her little bottom touches the ground all the way, say "Sit", give her the treat and give her lot's of praise. Don't worry about her not staying in the sit position for very long - that will come in time. Training a puppy to lay down is just a natural progression after he learn to sit, and isn't very difficult either. Just follow the steps below. Before you start training your puppy to lay down, make sure he's got the sit position down pretty good with out you having to bribe him with a treat every time. Have a treat in your hand and put him in the sit position. While he's still in the sitting position, hold the treat right in front of his nose and then move it slowly down to the floor. His nose will naturally follow. It may help to get down on his level, either sitting or kneeling on the floor. The second his belly hits the floor, say "Down", give him the treat and praise him like crazy! 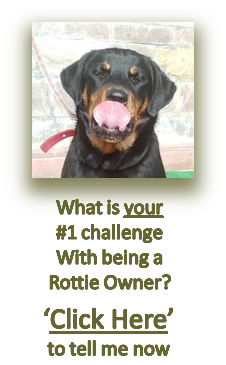 If he doesn't get into a laying position, you may need to restart him in a sit position, or even give his collar a very light tug to help him understand what you want. Especially when you're puppy is young, you don't have to use force of any kind to train him properly. Using positive methods when training a puppy will get you much farther much faster than force of any kind will every do! 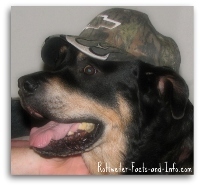 Patience - Persistence - Consistency are what wins the day when training a Rottweiler puppy. Information on this website is not intended to replace the expert opinion of your veterinarian, if your dog needs medical attention please contact a professional.